Ok, I’m going to be honest with you all: I have no idea what’s happening here. 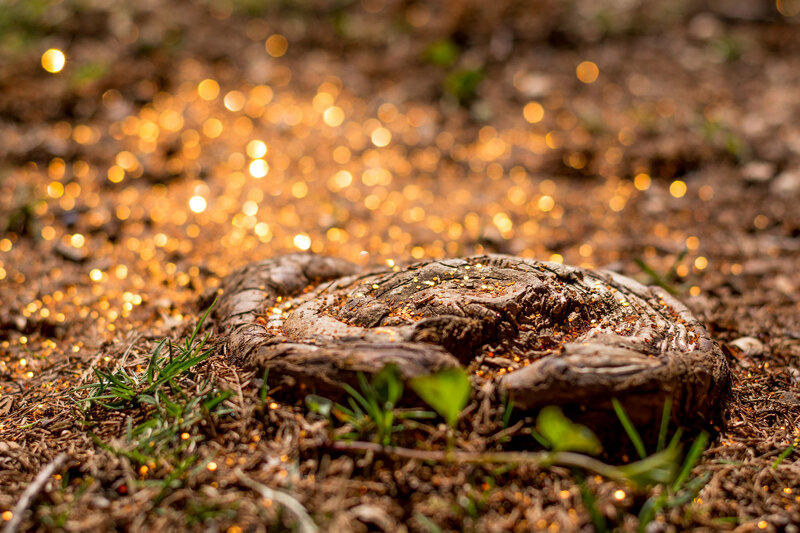 I was out for a walk around Theta Pond here on campus with my coworker when I saw this tree stump next to the sidewalk with…a bunch of orange glitter on it for some reason. I took this during spring break so there wasn’t really been any parties or any big activities at all on campus, and yet someone had seen fit to place, spill, or otherwise deposit a large helping of orange sparkles on the ground. As so often happens on these Weekly Fifty photos I walked right past it and thought “Huh. That’s interesting.” A few seconds later I turned around and, with my D7100 + 50mm lens in hand, decided to see if I could use this scene to make some kind of an interesting image. I’m not sure if I succeeded or not, but I do know I haven’t really taken a photo quite like this before. As I knelt down to make this image I knew it would succeed or fail based on two things: the right depth of field and whether I could get the composition just right such that the sunlight would be dancing off the glitter. The latter wasn’t too difficult, as I quickly found an angle and position that I thought would work well but the former was a bit more tricky. I knew I wanted the stump to be in focus and the background to be blurry, but I also knew that the wider my aperture was the cooler the background would look. Ah, tradeoffs. That’s what photography is all about, isn’t it? Some focus stacking could have helped me but I have neither the time, the inclination, or the equipment necessary for that sort of thing so instead I just did the best with what I had. I took a few frames at f/1.8 and then, remembering how many pictures I have ruined with depth of field that was simply too shallow, I closed my lens down to f/2.8 and took two or three additional pictures. I didn’t go any smaller than that because I knew f/4 wouldn’t get me the background I was aiming for, but I did get a few shots at f/2.4 just for good measure. I briefly checked the back LCD screen for composition but at no point did I examine the details to make sure I was getting the depth of field and sharp focus I was hoping for. I honestly was just trusting my instincts on this one, partially to see if it would work and partially because I didn’t want to spend ten minutes agonizing over, and trying to perfect, this image. After all my coworker and I were on a five-minute break, not an hour-long sabbatical. Later on in Lightroom I did a few tweaks to the color and added a bit of sharpening on the stump, but mostly the image you see is how it looked in camera. This did give me some ideas for a few pictures that might be fun to try with toys and some glitter of my own, but if nothing else I think it made for a fun image that I felt lucky to be able to capture. I like it. Very unique shot of a tree stump. Has a kind of magical feel to it! Your instincts were good. I saw this image pop up on Flickr and from the comments, I was not the only one wondering what made that gorgeous bokeh. Now you have me wanting to play with glitter and maybe a macro filter. Ooo…if you get out that macro lens and some glitter I’m sure you will come up with some amazing photos Rebecca! I did go out with the Macro filters tonight. Ok. Good. I’m glad you said it was a stump. My first instinct, being you’re in Oklahoma and all, was that a cow patty was at the end of a rainbow! Hahaha! I know what you mean Janet!